The Liberal Democrats have launched a digital ad blitz that borrows technology from Barack Obama's two successful US presidential election campaigns. The project, called 'Operation Manatee', will deliver more than two million targeted messages to voters through Facebook and YouTube in the final 72 hours of the General Election campaign. The party is using Connect, a canvassing database used by Barack Obama for his two presidential election victories. The campaign matches information about topics important to an individual (gleaned from doorstep conversations), demographic and electoral roll data with Facebook and YouTube profiles. The data is then used to target relevant ads to individuals online. The party ran a large scale trial of the technology in London during the 2014 local elections. 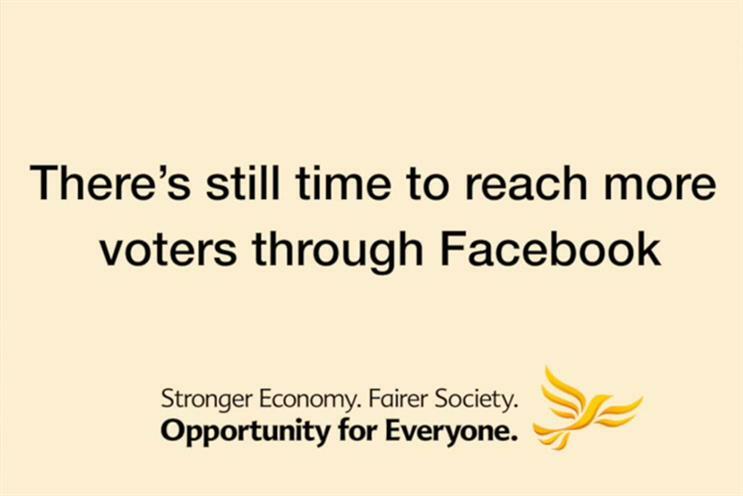 It has claimed that voters who saw targeted ads during the final few hours of the election became significantly more likely to vote Liberal Democrat. Steve Pitman, the Liberal Democrat's digital director, said: "This is the first time any political party has been able to target digital communications in this way. "Typically, voters would be targeted simply by geography, but that means you're sending an awful lot of people the wrong message. "This is different. For example if you tell one of our activists that the NHS is a key issue for you in the election then we could present you with a video on YouTube or Facebook which reflects that." The Manatee project sits alongside other developments by the Liberal Democrats for this election, including the roll out of digital campaign platform NationBuilder and the MiniVan mobile app, which allows activists to canvass using their smartphone or tablet. The Lib Dem website has also been customised to deliver localised content based on each visitors’ location.